The Star Performing Arts Centre has officially opened today – 1st November 2012, with a grand opening concert by David Foster and friends over the next 2 days. This is pretty exciting for the local arts culture with a new performance space boosting a 5,000 seat theatre. Sogurt is a home-grown, yogurt-by-weight shop that screams of pastel pink and lime green, likely to attract the young and cheery. Contrary to many other shops, they even offer students in school uniform a 20% discount. Adults are warned not to try squeezing into their pinafore or tight shorts. 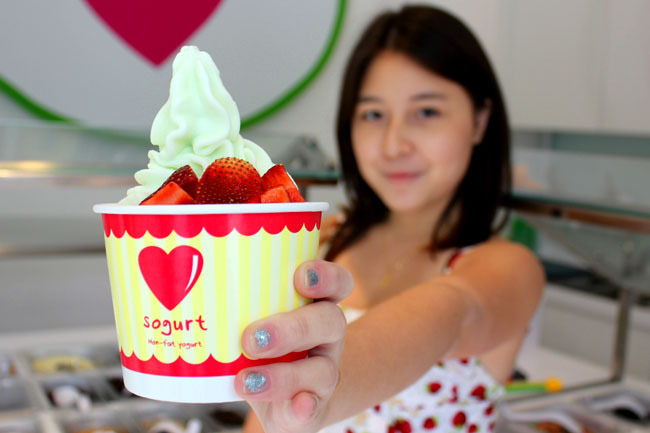 I spoke to its owner Lee Li Ping, whom at age 25, has already opened 5 yogurt stores. Usually get people to guess this one, but think you can sorta guess? I chose Sogurt cos it rhymes with “yogurt”, and would have a catchy tagline “Sogurt is SOOO GOOOOD”. Was pretty amused with the name myself at the start. 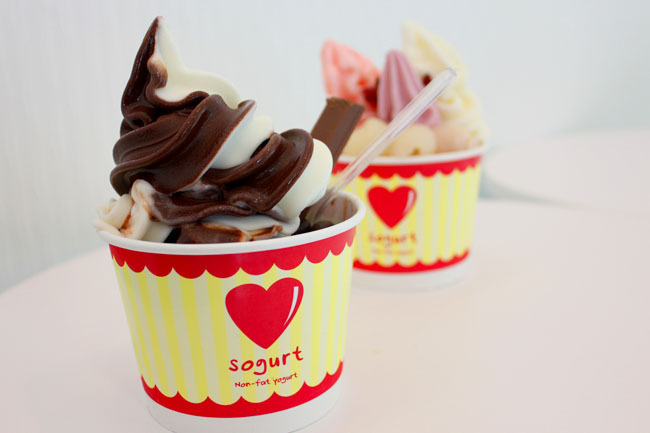 Initially, I was set on “YO-mama”, but later discovered that a froyo store in HK already had the name, and hence had to come up with a new one, “Sogurt”. No regrets! Why did u choose to sell yogurt? Yogurt is my personal passion. I still eat my froyo almost every day, even after 3 years of being in business. Not sick of it one bit yet. What were you doing before going into yogurt business? 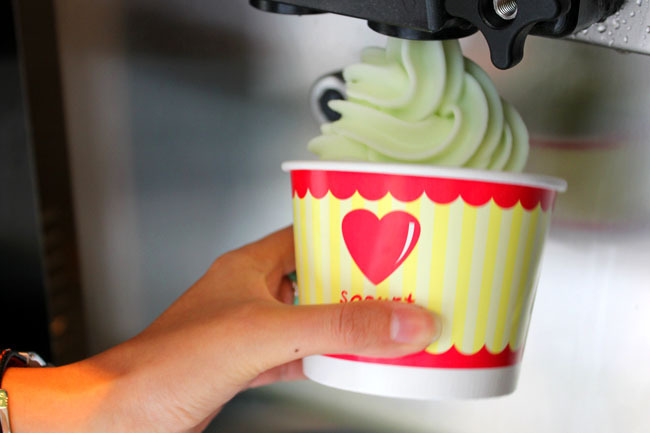 I started Sogurt 3 months after graduating from USC (University of Southern California) in LA. It all started with my obsession for froyo when I was there, used to drag my friends to eat it with me every single day. Helped a lot also that there was a rising froyo trend in the U.S. while I was studying there. 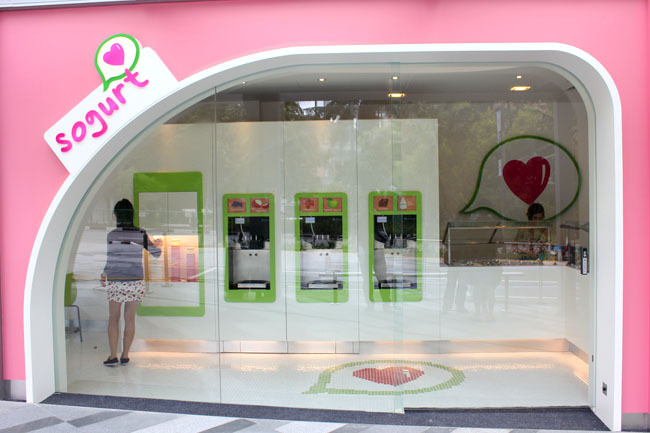 I was especially impressed and enticed by the self-serve froyo concept, thus came back and decided to share this love with my fellow Singaporeans. 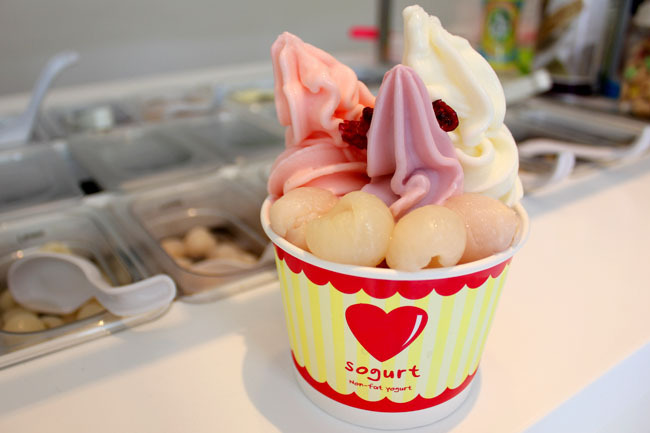 What is your personal favourite Sogurt flavour? Chocolate! I have a sweet tooth, love Sogurt’s choc flavour with nuts, digestive biscuits and sunflower seeds. Awesome combo! How about the customers’ favorite? This is a tough one as there is no ONE favourite flavour, but I’d have to say our lychee flavoured yogurt is quite a hit. How do you ensure the yogurt doesn’t melt too fast in Singapore’s blazing heat? Have a good AC system in our shops to shield our customers from the hot hot heat. Besides that, I guess I can say our yogurt is pretty delicious that it is usually finished even before given a chance to melt! For those unfamiliar with the self-serve concept, steps are simple: Take cup; dispense the yogurt ; select the toppings; weigh the cup and pay $3.00 for each 100 grams you take. Get the chocolate. It is really SOOO GOOOOD. 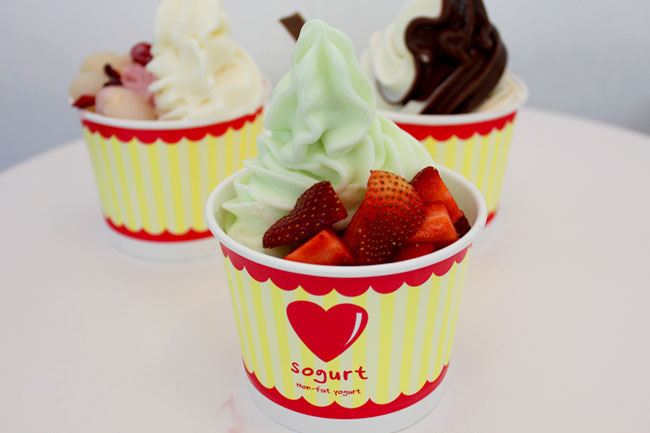 Hi, i am new here and i am trying to be blatantly honest with the fact that Sogurt DOES NOT SERVE LOW-FAT yogurt AT ALL. This is really a disappointment when i found out too. I was at the Serangoon Nex shopping mall outlet and the workers were using FULL CREAM MILK to make the thing that they claim is low-fat but it is not. Yogurt is good and i love to have it at least 2 x a week but i cannot hestitated and tve that they serve 100% FAT MILK. Still they claim it is LOW-FAT etc etc. Such an embarrassment. I actually confronted the workers one day as i could not stand it, they still hesitated and put the milk aside. I am not accusing but you can witness with your very own eye when you visit any of their outlet. I also been to newly renovated outlet at upper bukit timah and yes, they use the same FULL CREAM MILK They know their recipe well and still have the cheek to claim they are low in fat content. I can assure you that Yami yogurt, Yogugu, Red Mango, Frutti Truitti and other many yogurt chain serves low-fat milk as i had the chance to have a brief talk with the people there. They daringly showed me the type of low-fat milk they use. If you do not want to be a victim, please spread the word. I can tell you it is as unhealthy as ice cream. Cheers to you.